When the back of the strap of this dress came out, my little girl desperately wanted to turn this into a one strap dress. I took a look at the bodice and determined it would be an awkward and immodest design. I told her I would sew the strap back on for her later that day. She took matters into her own little hands (she's 5 years old) and cut the strap completely off. I keep looking at it, groaning that a 4 second repair has turned into this interesting challenge. It was a $4.00 find at a thrift store, thank goodness. It is made out of several layers, the top layer is maybe organza fabric? 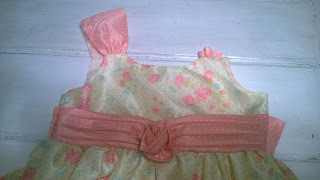 Any ideas on how to salvage or re-work this pretty little dress? How about a bow or fabric flower to cover the patch job you'll need to sew the strap back together? That's great that you have a budding refaahionista and that she's learning from you! You could cut off the other strap and sew new, different colored straps on. Maybe a light blue or light green from your scrap pile? Like Emmy said - maybe your little girl would enjoy some new fluffy tulle straps! Maybe you could make thinner (even spaghetti-type) straps from the remaining wide strap. I think it's awesome that your little girl is interested in doing what you do, even if her choice of starting garment was perhaps not as well thought out as a grownup's would be :) Can you get a couple of thrifted items for her to "help" you make over? Good luck with fixing the dress! Please share your after with use. I was so glad to see the Refashion stopped with the straps. I see several great suggestions. - divide the remaining strap and underlay both with some matching material (= use each division as 'centre-piece' ) of the matching size to the the old strap-outlet (sorry for my unqualified English) on the dress. It surely can be done modest (enough) to make the young still 'flat-chested Lady' (= nothing yet to be looked/stolen off ;-) ) happy. Finally: PLEASE discuss future 'companion-ship' of working together ;-) ! How about using a clear bra strap and giving you daughter her one-strap wish, modestly? Make a skirt out of it!!! What about taking off the other strap... and using it to make two straps.